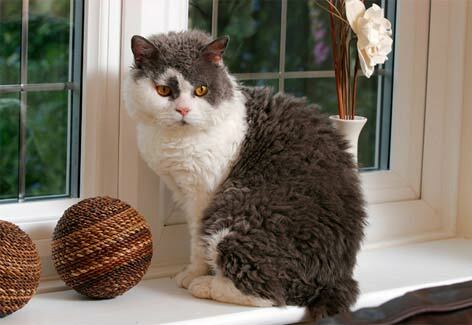 Selkirk Rex cat breed information and advice. Selkirk Rex cats are cheery little cats with an easy-going temperament. The Selkirk Rex cat makes an excellent family pet. Not only are they playful and very attached to their humans, but they are also good with children and are very placid. They are happy to live both the indoor and outdoor life and love company. These cheery little cats have an easy-going temperament and are renowned for their charisma. They love human affection and are placid and laid-back. Selkirks are also said to be very loyal and devoted companions, playful, cuddly and very 'purr-y'! Selkirks are very adaptable and will suit most households as they are happy as lap cats, and they also enjoy access to the outdoors too. But they do like company so if you will be out all day, make sure you have two cats to entertain each other. The most eye-catching thing about the Selkirk is their delightfully curly coat, which comes as either a shorthaired or longhaired variety, while a variant has straight fur. The Selkirk Rex's curly coat is the result of a dominant gene that causes each hair to have a gentle wave or curl, giving the coat a soft feel. The curliness of the coat is variable according to age, gender, climate, time of year and hormones, particularly in the female. Due to the gene which makes their coats curly, a litter of Selkirk kittens can be 50 per cent curly and 50 per cent variant. Selkirk Rex kittens may lose their curls as they grow but develop adult curly coats from eight months onwards. Selkirk Rex come in a huge variety of colours and have medium to large bodies with full-cheeked faces and large, round eyes. The Selkirk Rex originated in Montana, USA, in 1987 when a Persian breeder adopted a 'strange looking' curly-coated kitten from a local shelter. She bred her to one of her black Persian males and three of their six kittens had curly coats. Selkirks arrived in the UK in 2002 and were given GCCF championship status in 2009. It is recommended that Selkirk Rex are groomed weekly using a wide-toothed comb so their fur doesn't become matted. Their curly fur can also sometimes cause irritation in the ears so clean these weekly. Make sure your Selkirk Rex kitten comes from a responsible breeder who has screened their cats for Polycystic kidney disease (PKD) and Hypertrophic cardiomyopathy (HCM).